SCVHistory.com | Del Valle Estate | Filing of Probate Petition, Death of Juventino Del Valle, 1919. Filing of Probate Petition, Death of Juventino Del Valle. Bulk of Del Valle Estate Left to Widow. (Oxnard) Press-Courier | Wednesday, June 11, 1919. 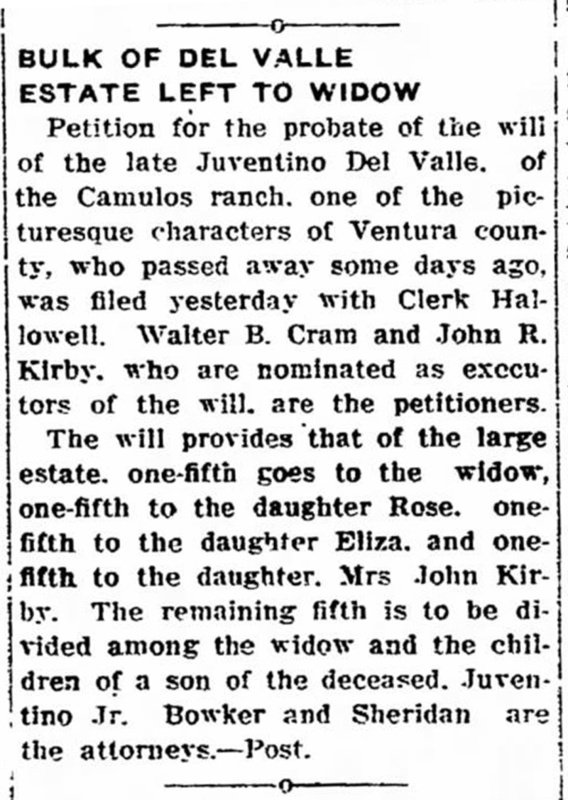 Petition for the probate of the will of the late Juventino Del Valle, of the Camulos ranch, one of the picturesque characters of Ventura county, who passed away some days ago, was filed yesterday with Clerk Hallowell. Walter B. Cram and John R. Kirby, who are nominated as executors of the will, are the petitioners. The will provides that of the large estate, one-fifth goes to the widow, one-fifth to the daughter Rose, one-fifth to the daughter Eliza, and one-fifth to the daughter, Mrs. John Kirby. The remaining fifth is to be divided among the widow and children of a son of the deceased, Juventino Jr.
Bowker and Sheridan are the attorneys. — Post. Webmaster's note: You're not crazy. The original headline makes no sense.